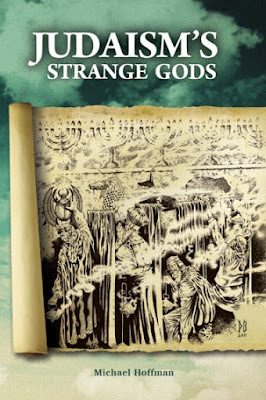 On August 13, 2018 Amazon banned Michael Hoffman's Judaism’s Strange Gods: Revised and Expanded, which was published in 2011 and sold by Amazon for the past seven years. Along with his much larger study, Judaism Discovered (sold by Amazon since 2008), this book has had an international impact both as a softcover volume as well as a digital book circulating on the Amazon Kindle. Sales to India, Japan and the Middle East were rapidly growing. The digital Kindle format is particularly important for the circulation of books because it bypasses borders and customs and hurdles over the prohibitive cost of shipping which the US Postal Service imposed on books sent to overseas destinations several years ago (the Post Office eliminated economical surface mail sent by sea; all books now must be shipped to Canada and overseas by very costly Priority Air Mail rates). Amazon has also banned Hoffman's The Great Holocaust Trial: The Landmark Battle for the Right to Doubt the West’s Most Sacred Relic (sold by Amazon since 2010), an important eye-witness account of the historic trial of a dissident publisher in Toronto, which has been cited as a source of information even by the Zionist organizations in Canada. Now this primacy source material on a civil liberties milestone is down the Orwwellian memory hole, at least as far as "earth's biggest bookstore" is concerned. Researchers, students and the public who wish to read it must now take the time and trouble to resort to a rare book search service. The three banned volumes maintain a high standard of scholarly excellence, had a majority of favorable reviews from Amazon customers, are free of hatred and bigotryand have sold thousands of copies on Amazon. There is a nationwide purge underway that amounts to a new McCarthyism — blacklisting and banning politically incorrect speech and history books under the rubric of “hate speech” accusations, initiated in part by the Southern Poverty Law Center (SPLC) and the Anti-Defamation League (ADL). Banning and censorship were not part of Amazon CEO Jeff Bezos’ public philosophy when he founded the company in 1994. Amazon experienced explosive growth in part because it functioned as an intrepid gateway to authentic works of scholarship, however much they were demonized, reviled or condemned by infuriated political or religious factions and pressure groups; that libertarian philosophy of freedom changed beginning in 2017, when Amazon gained a virtual monopoly over the sale of books in the United States. In addition to our work being hate-free, we note that Amazon sells dozens of hateful Zionist and rabbinic volumes brimming with ferocious bigotry for Palestinians, Germans and goyim in general. For example, in 1997, Daniel Jonah Goldhagen wrote and Amzon began to offer, Hitler's Willing Executioners, one of the most racist books of the modern era. In it, Prof. Goldhagen purported to demonstrate that Nazi mass murder stemmed from an innate German predisposition to kill Jews. His book promulgates a theory of a genetic homicidal trait infecting the entire German nation. This bigoted trash has a right to be sold. We uphold that right because exposure of its thesis is the most effective indictment of its author. We note that Hitler's Willing Executioners is proudly sold by Amazon and, if the current zeitgeist persists, it will never be banned by Amazon. 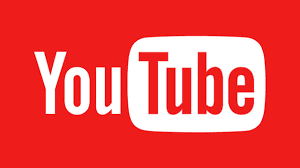 The target of Mr. Goldhagen's hatred is the German people who he collectively defames as a racially tainted ethncity. Consequently, his book constitutes a righteous type of hate— the approved hate that does not offend the Southern Poverty Law Center or the ADL. Many dozens of books containing savage attacks on Christianity are also sold by Amazon. These volumes seem to be immune from removal and suppression. Meanwhile, the censors demand for their own media — Mr. Bezos owns the Washington Post newspaper — freedom of expression for the writers they employ and the speech of which they approve. In this two-tiered ethical system we observe the familiar hallmark of revolutionary tyranny: the insiders demand and grant to themselves and their comrades the freedom they deny to demonized outsiders, using the phony “hate” imputation as their excuse. The Washington Post has as its motto, “Democracy dies in darkness.” Yet it is in that very darkness where Amazon’s book-banning dwells, due to the apathy of the media and the timidity of the American Bookseller's Association and the American Library Association. 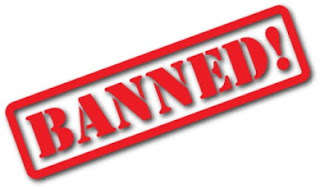 To ban books by a vulnerable independent scholar is not exactly a daring move in an age when “hate speech” is any scholarship which challenges someone’s sacred traditions or cherished folklore. The definition is so loose it functions as a one-size-fits-all inquisitor’s sword, and the non-persons who are the victims of this new inquisition are expected to descend quietly into sheol. Michael Hoffman's critique of Orthodox Judaism constitutes a radical reassessment founded upon the depth of the documents and arguments he marshals in the course of advancing his thesis. The compelling and original scholarship employed in his study of Orthodox Judaism is never “anti-Semitic” or hateful. This would be easy to prove if there were an Amazon “tribunal” fair enough to consider a little something known as evidence. 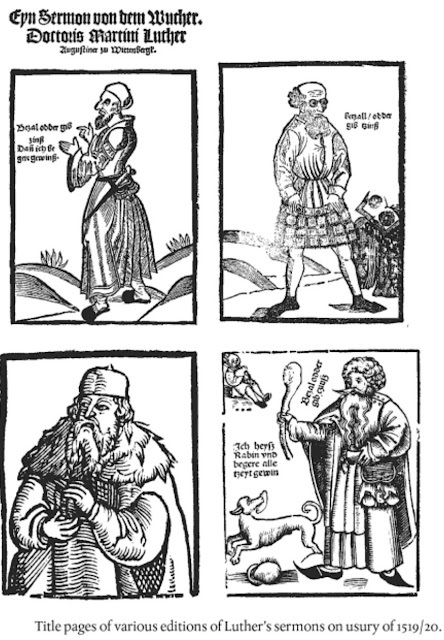 In both Judaism Discovered (p. 39) and Judaism’s Strange Gods: Revised and Expanded there are statements addressed “To the Judaic Reader”(photographically reproduced here: pp. 18-19, and here: p. 25), expounding our love and concern for their welfare and liberation. No book of “anti-Semitic hate” would ever print any such charitable and compassionate statements, and these are representative of the entire tenor of the volumes under consideration. Enemies of truth can easily turn to their advantage books containing hatred of “The Jews.” What they have no credible answer to is a critique predicated, as our books are, on a sincere foundation of true Christian love. Boundary-breaking scholarship united to compassionate concern for the welfare of Judaic people is almost unprecedented in this field. This approach makes Michael Hoffman's studies of Judaism among the most powerful and effective because they are free of the “hate speech” which is the pivot upon which turns the machinery of liberal-approved censorship. For that reason, making Judaism’s Strange Gods: Revised and Expanded, and Judaism Discovered available on the Kindle undercut decades of hatred and libel. Therefore those volumes had to be suppressed. A Kindle permits anyone connected to the Amazon website to read approximately the first thirty pages of any Kindle book free of charge. 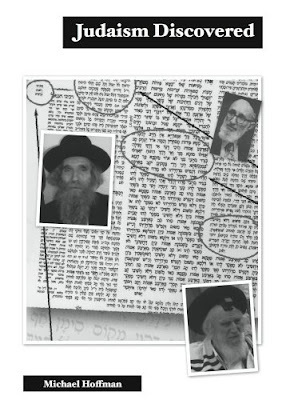 Consequently, Hoffman's Judaica research was on display around the world and therefore it was much harder to lie about him and mischaracterize his Talmud and Kabbalah research under those circumstances. Moreover, Judaic people are harmed by this book-banning which creates a special category of informed theological criticism that is banned from the Amazon Kindle and thereby obstructs the advancement of learning. To make an exception for Orthodox Judaism — forbidding the sale of the best scholarship critical of it— does no favors to Judaic people. Many Judaic persons don’t approve of this type of suppression and censorship of books and desire access to our information. We have received letters and e-mail from Judaics who were appreciative of our books and surprised by their evident compassion and concern for “Jews." If we are wrong, show us where we are wrong, don’t signal through censorship that our facts are too explosive to be handled by inquiring minds; that type of suppression will only blowback on the censors. 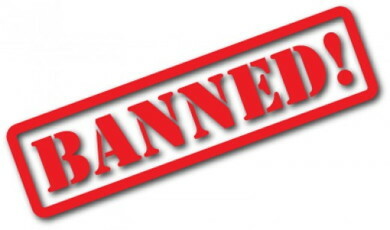 Furthermore, to be banned by Amazon is not equivalent to being banned by any other private business. Most publishers will admit that Amazon has replaced Bowker Books in Print as the industry’s authoritative guide to what books in English have been printed in the past and what is in print now. Amazon is currently the reference source. For a book to be forbidden by Amazon renders it largely invisible. It is equivalent to burning the book. So this is not a matter of Amazon exercising the prerogative of private enterprise. Amazon is a monopoly. It has no rival. If your book doesn’t exist on Amazon, then for most people who are not research specialists, your book doesn’t exist. The consequences for the pursuit of knowledge are ominous. The public should be informed of the disgraceful tactics of the hypocrites who are so fearful of the radical scholarship for which they have no credible answer, that they pressure booksellers to ban the books that contain irrefutable challenges to their sacred dogmas. Human learning is often advanced by means of suppressed facts and ideas. This was formerly a truism in America, up until the rise of the Overlords of social media who seem to be more like a branch of Antifa than an intellectual class invested in discovery and enlightenment. But the epigram of our time is “Error has no rights.” This was the doctrine of the fiery Inquisition, of the head-chopping French Revolution and of the Bolsheviks, Nazis and Maoists. If error has no rights then neither does truth, in that what is denounced as hateful error by the mob is sometimes a destabilizing, necessary and even cosmic truth. 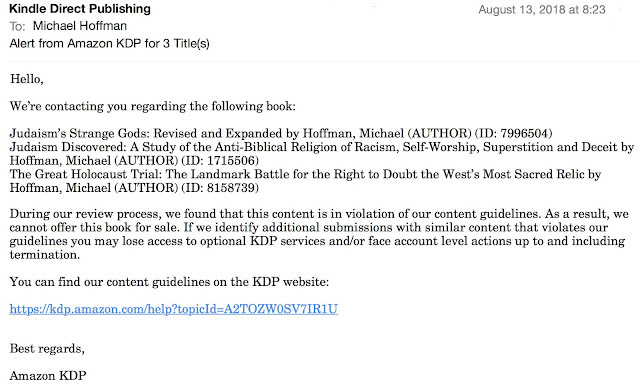 The ban on these three books of ours, particularly the complete ban (Kindle + printed book) on Judaism’s Strange Gods: Revised and Expanded, as well asJudaism Discovered banned from the Kindle, represents a signifcant loss to us of revenue. If we don’t somehow make up for this serious shortfall it will imperil our entire enterprise. This is in God’s hands. 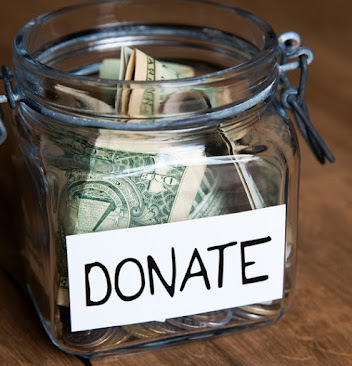 Our prayer is that He inspires benefactors to assist us in this our time of need, as well as in the weeks and months ahead as we search for a replacement for what was regular monthly sales income upon which we depended for our Truth Mission. The greatest loss of course is to minds hungry for knowledge, whether in India, Japan, the Middle East, Europe or here at home. Learning is a right which the book-banning antediluvians have now denied to readers and students throughout the world. God help us all. Revisionist historian Michael Hoffman is one of the most controversial scholars of the 21st century. The Southern Poverty Law Center and the ADL seek to shut him down and ban his books because they can’trefute his research. 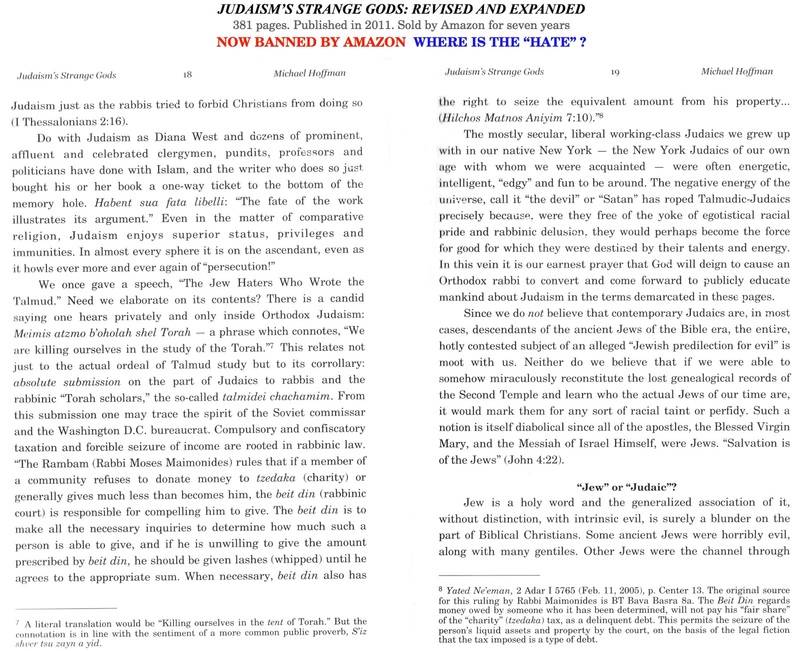 The Tech Tyrants are considering banning Judaism’s Strange Gods: Revised and Expanded (382 pages; published in 2011) and sold by Amazon ever since. Along with the much larger study, Judaism Discovered, it has had an international impact circulating on the Kindle. These books maintain a high standard of scholarly excellence, had an average of four stars (out a possible five stars) favorable reviews, and are free of hatred and bigotry. They do however present a radical challenge to consensus history. Suddenly we are being told that "Amazon KDP" has discovered that the books have been in violation of Amazon’s “content guidelines” all these years. Asking for documentation of the charge results in no response. It is enough that the accusation has been tendered. The accused are guilty until proved innocent, although how proof of innocence is presented is anyone’s guess because there is no formal appeals process. There is a nationwide purge underway that amounts to a new McCarthyism, blacklisting and suppressing politically incorrect speakers and history books under the rubric of “hate speech” accusations, initiated in part by two Zionist thought police organizations, the Anti-Defamation League (ADL) and the Southern Poverty Law Center (SPLC). In addition to our books being hate-free, we note that there are hundreds of hate-filled Zionist and rabbinic books brimming with ferocious bigotry for Palestinians, Germans and goyim in general, which are sold by Amazon. These hate-filled volumes to do not offend the ADL and SPLC, America's most powerful censors and arbiters of which books deserve circulation and which require censorship, therefore bigoted Zionist and rabbinic books are immune to removal and suppression. We have requested an appeal on the ban on our books. "Garrick Small weighs in on the usury issue, including Mr. Hoffman's claims, in the letters column of the September 2018 issue of Culture Wars. I stand by my claim that the Church has not changed her position." 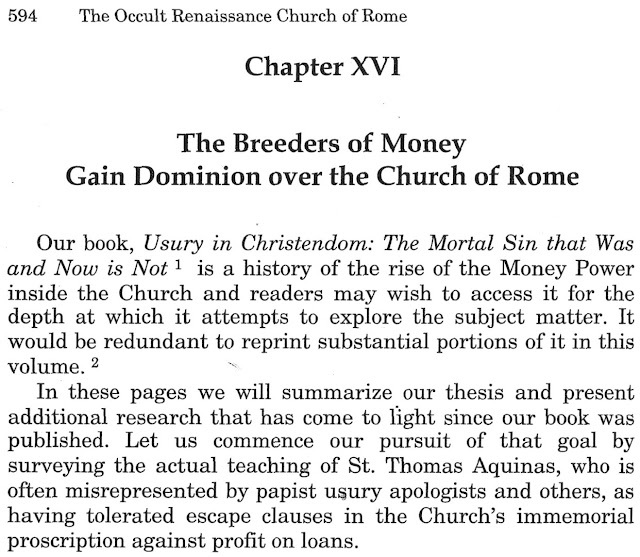 In addition to hundreds of pages in my book Usury in Christendom: The Mortal Sin that Was and Now is Not, my most recent “reply" to disinformation about Rome’s Money Power, such as Dr. Jones appears to be promoting, will be found on pp. 594-631 of The Occult Renaissance Church of Rome (consisting of the chapter, “The Breeders of Money Gain Dominion Over the Church of Rome"). Printed editions of Martin Luther’s thunderous sermons against renting money. These anti-usury pamphlets were banned by the Medici pope and circulated only in areas not controlled by Rome. 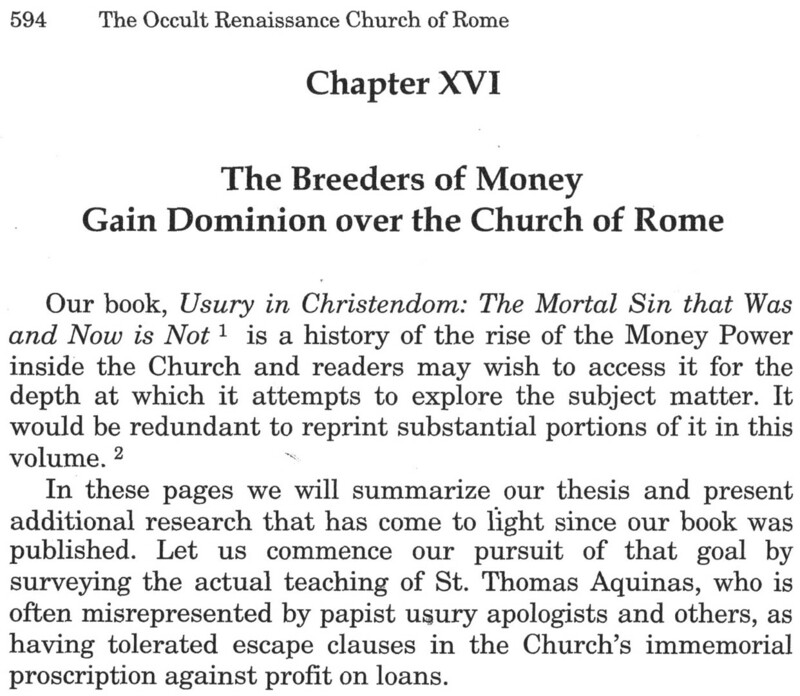 Dr. John Rao of “The Roman Forum” held a symposium recently on how Martin Luther was supposedly the source of the rise of greed in Christendom, when in fact, a substantial part of Luther’s revolt against the papacy was his rage over the incremental papal permission for renting money, most notably by the detested papalist banking house of Fugger in Germany, and in Italy, the Medici bank, on whose behalf Medici Pope Leo X, on May 4, 1515, loosened some of the strictures against usury for the sake of alleged "charity-lending to the poor.” Papal situation ethics were employed for the accumulation of filthy lucre by Leo X's family’s banking house and that of others like them, using the alibi of the Monte di Pietá. The gradual steps initiated by the Renaissance and post-Renaissance pontiffs, evolving from covert incremental loosening to full overt permission for usury, took a little more than three centuries, culminating on August 18, 1830 in Pope Pius VIII’s directive to the effect that those Catholics who take interest on money to the rate permitted by law are free to receive Holy Communion and need not confess what had been a mortal sin for the first millennium of Christ’s Church. This remains the situation for contemporary church-goers. Perhaps it was a coincidence, but two years later, in 1832, the Rothschild bank of Paris extended a loan to keep the papacy afloat. In July 1849 the pope (Pius IX) cast lines anew to the Rothschild bank. In January 1850 Rothschild approved a loan of 50 million francs. In 1857 Vatican Secretary of State Giacomo Antonelli used Peter’s Pence as collateral in negotiating a new loan with Rothschild (cf. Usury in Christendom, p. 265). 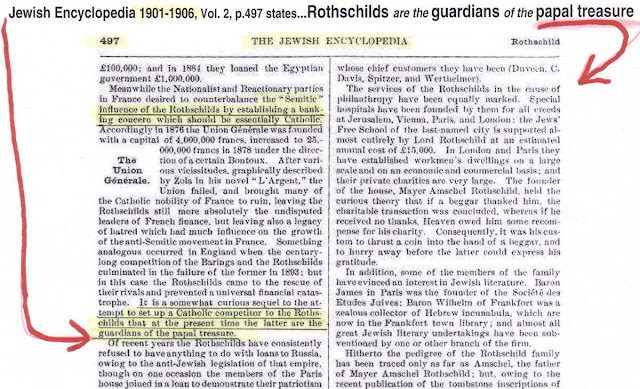 “The Rothschilds…are the guardians of the papal treasure.” Jewish Encyclopedia, vol. 2, p. 497 (Click on the image to enlarge it). If Drs. E. Michael Jones, John Rao and other Romanist leaders like them, along with their supporters, will not study the evidence in my two books and attempt to refute it, what would be the point of any engagement with them on my part? As we have noted numerous times since its publication in May of 2017, the vast majority of “conservative Catholic” and “traditional Catholic” editors, bloggers and podcasters have given The Occult Renaissance Church of Rome the silent treatment. This is a technique well-known to victims of the Zionist media; that it is employed by the Romanists comes as no surprise to this writer. When partisans have no credible answer to new discoveries in history which seriously undercut their belief systems, they suppress them. The similarity to rabbinic tactics of evasion and avoidance is striking. “A voice crying in the wilderness"